The controversial evangelical Bible scholar and author of The Bible Tells Me So explains how Christians mistake “certainty” and “correct belief” for faith when what God really desires is trust and intimacy. Enns offers a model of vibrant faith that views skepticism not as a loss of belief, but as an opportunity to deepen religious conviction with courage and confidence. This is not just an intellectual conviction, he contends, but a more profound kind of knowing that only true faith can provide. 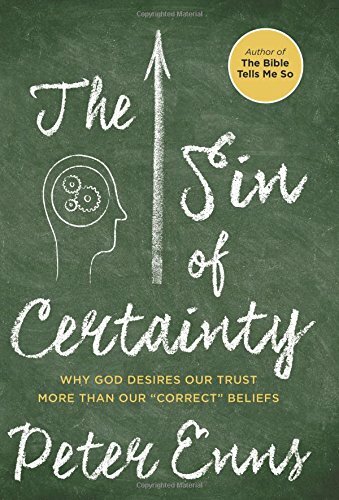 Combining Enns’ reflections of his own spiritual journey with an examination of Scripture, The Sin of Certainty models an acceptance of mystery and paradox that all believers can follow and why God prefers this path because it is only this way by which we can become mature disciples who truly trust God. It gives Christians who have known only the demand for certainty permission to view faith on their own flawed, uncertain, yet heartfelt, terms. Save on College Textbooks with Low Price Books for Android !